Kick-start your skin rejuvenation with our Candy Apple Peel. A light, firming peel with minimal down time, this is the perfect treatment to begin your holiday season. Relax, renew and unwind with our Spiced Chocolate Facial. An indulgent spa experience that leaves skin radiant and ready for those holiday parties. Expires 1/31/19 as products will not be available after this time. YOU’RE INVITED to come and celebrate with Champagne and Chocolate! 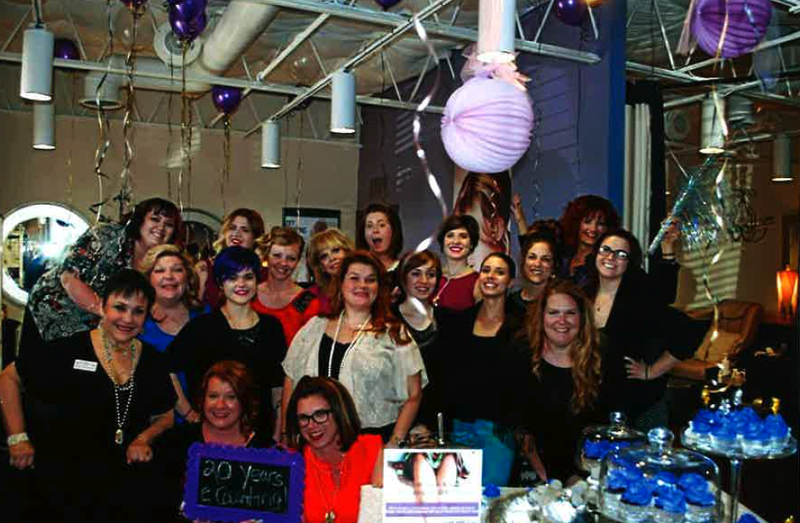 Local Business Celebrates 25 Years by bringing a whole new look to their Salon and Spa in downtown Heath! Growing with the Community has come natural for Award Winning Heath Hair Salon and Spa. 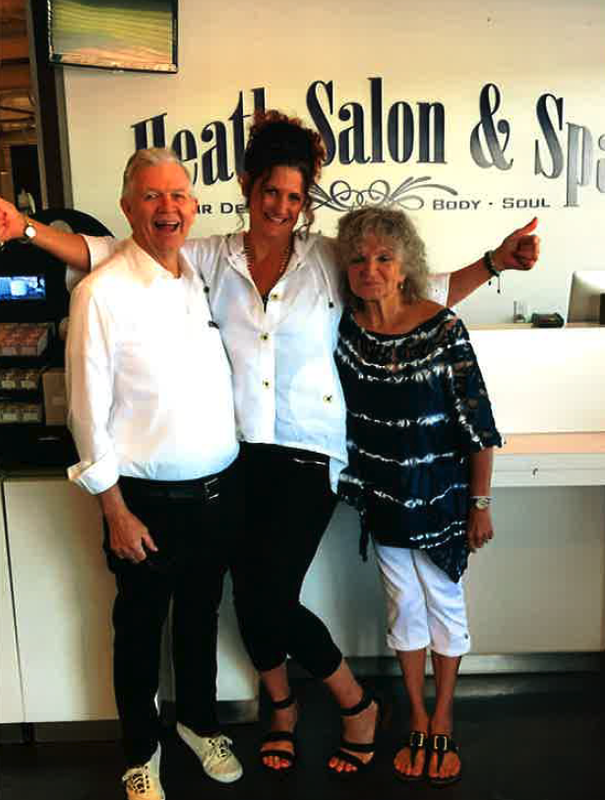 Starting with a deal she couldn’t refuse, Jauna French purchased Heath Hair Company in 1993 from Judy Kile, who had owned it for 9 years and had different dreams. Curtis and Jauna French then began their journey of Salon ownership. At the time it seemed crazy because they had only lived in the area for a year and had a one year old son, who was the reason to go for it! 950 sq. 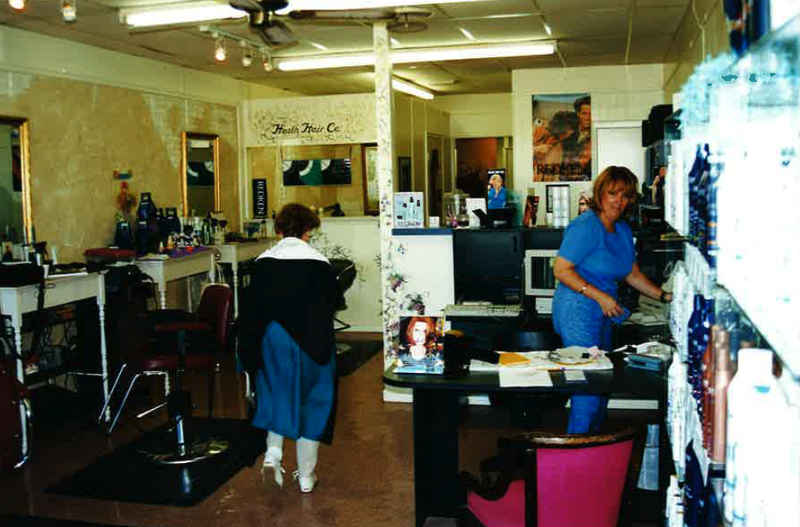 ft. with two pink shampoo bowls, two salon chairs, a manicure table and the signature 90’s country blue and mauve décor…Heath Hair Co. was the French’s future. The desire to work with a team and train each of the team to Redken Elite and Pureology Standard was the goal. Customer Service and Salon Professionalism was and is still the Standard. Jauna French, Hairstylist and Redken Performing Artist, coming to Texas from Oklahoma had enjoyed teaching other stylists for 8 years. Knowing that the dream included the best of the best artists working together with the goal of expertise in services, commitment of the company to team and growth for the career minded, learning how to manage and grow a company located out in the middle of nowhere became the Mission. Having the support of Redken to provide the best products and education in the industry, she knew it was possible. The Mission became even more of a reality when the French’s welcomed their second son in 1996 and Jauna chose to not travel and educate for Redken and concentrated on her business and raising her young family. 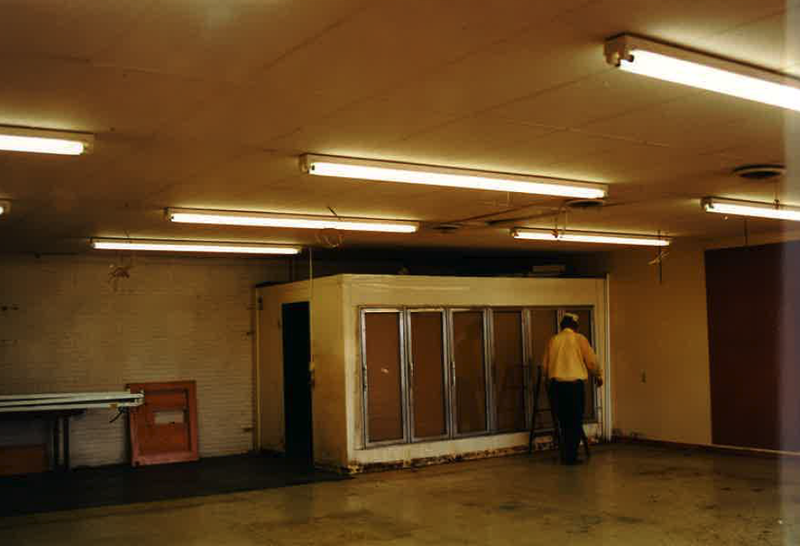 Many educational events later, learning with the intent of growing the team one service provider at a time, and many DYI projects later, in 2000, Heath Hair Co. expanded to 3000 sq.ft. and became Heath Hair and Day Spa. A totally new 8 chair, 3 shampoo bowls, private manicure and pedicure area, private styling area, 2 Spa rooms for massage and facial services and expanded gift shop in the Heart of Heath, TX. Enough room to continue growing service experts in hair, skin and nails…the dream was coming true. 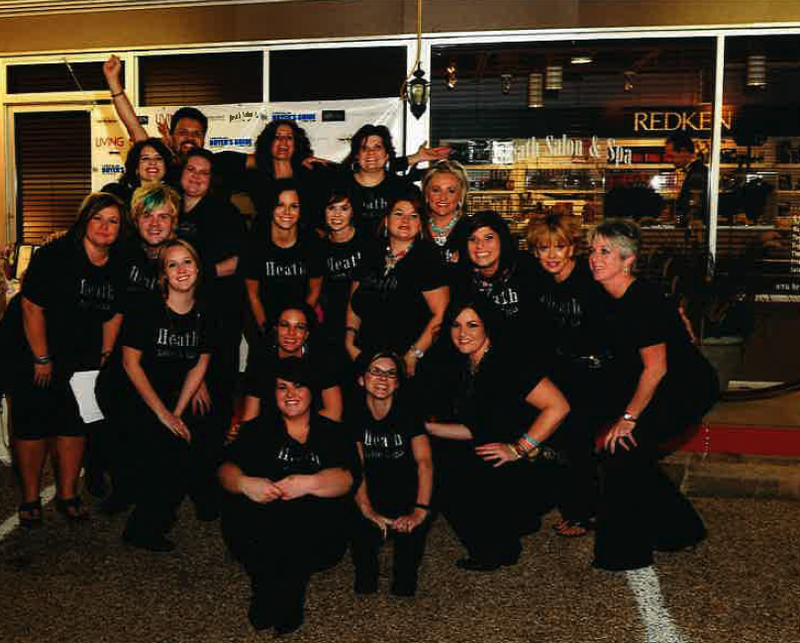 Heath Hair and Day Spa has been recognized in D Magazine as a Best in Rockwall Co., Salon Today Magazine as one of the Fastest Growing Salons in the US, Best of Rockwall Co.Lakeside Living and Redken as a Redken Elite Salon. This salon and spa’s commitment to the community has not gone unrecognized. Raising money and donating to local charities is just part of the culture. 10s of thousands have been raised by this tribe of Beauty Industry service providers and continues to be their passion and challenge to others to always find ways to ‘give back’. 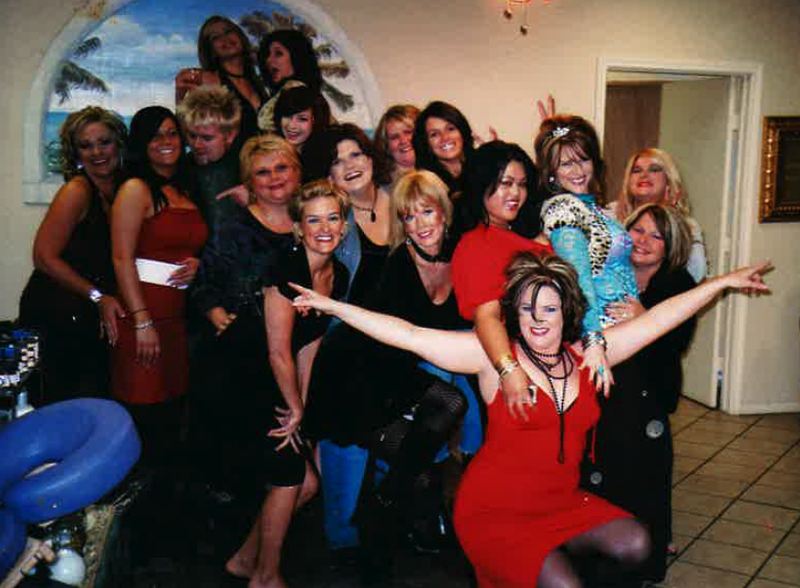 Continued growth of Heath Hair and Day Spa in both Team members and guests led to the next expansion in 2008 to 4500 sq. ft. Being a Redken Elite Salon brought opportunities that included sending NYC Designer, Peter Millard, to Heath. A total gut remodel produced 16 chairs with 4 shampoo bowls, 3 spa rooms and a private party/bridal area, became Heath Salon and Spa making its debut as the Premier Salon and Spa of Rockwall County. Surviving the economic crash of 2008-2010 was a struggle but the ‘New’ Heath Salon and Spa did more than survive, they grew! The past 10 years have been continued growth and support of the community and the original mission of growing one service provider at a time still continues. 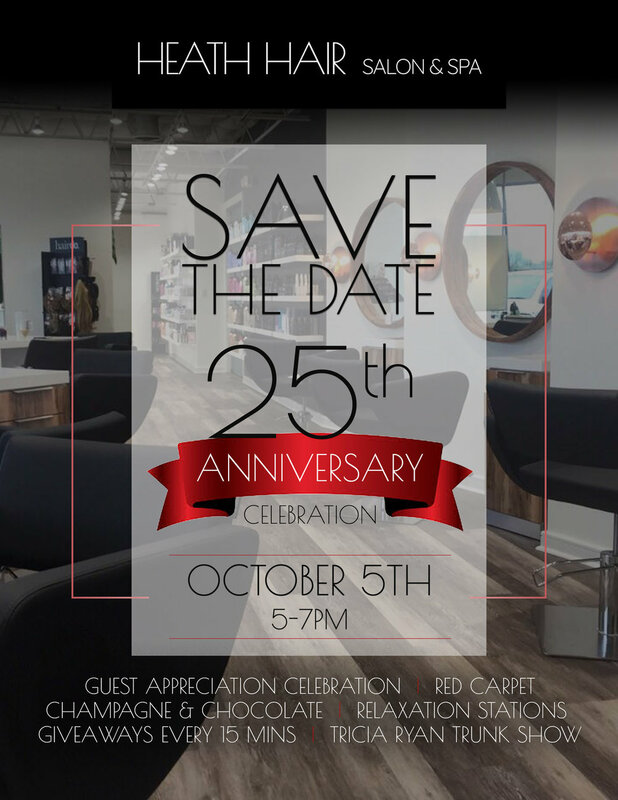 This year, 2018 Heath Hair Salon and Spa is celebrating 25 years in business. As Rockwall Co. has grown and changed, the desire to change with the Community is apparent in this company! A totally new renovation of inside and out with 28 chairs, 6 shampoo bowls and 3 spa rooms and a new, modern look has the town talking! When a community has been so supportive, you really want them to always have ‘the best’! Celebrating 25 years later, Jauna French is so passionate about providing a high standard of service and technical skill that continues to get better every year. The masters training program that the stylists at Heath Salon and Spa go through is the foundation of building Experts in Color, Cutting, Curl and Styling. They also have a Bridal Team that goes on site or in salon to give the very best in beautiful hair and makeup. The benefits of having a team is no matter what happens to a service provider, there will be an expert to take care of you. We have saved several brides from wedding day disaster when their hairstylist was sick or didn’t show up. The skincare experts can resurface and improve your skin beyond your expectations and the massage therapist, Meredith offers gifted, healing hands, utilizing essential oils and body balancing. It's truly ‘all about you’ at Heath Hair Salon and Spa.Expect the BEST! Your skin will fall into youthful radiance with Rhonda Allison’s Pumpkin Vitality Series. Pumpkin is nature’s richest source of vitamin A, and infuses the skin with potent antioxidants, brightens and smooths imperfections, while stimulates collagen activity. This series will give you beautiful, healthy-looking skin just in time for the Thanksgiving and Christmas season! The facials must be done 2 weeks apart to insure optimal results along with a home care regimen created by your aesthetician that will prolong the results from the treatment room! Begin the repair and rejuvenation process with our Pumpkin Peptide Facial. The perfect treatment to prepare the skin for the Pumpkin Apple Peel, this corrective facial firms, tones, hydrates and nourishes for an amazing glow. Rejuvenate and renew skin with the flavors of fall. Rhonda Allison’s Pumpkin Apple Peel awakens skin using all the benefits of apples and pumpkin to firm and tone while nourishing and brightening dull, dry summer skin. 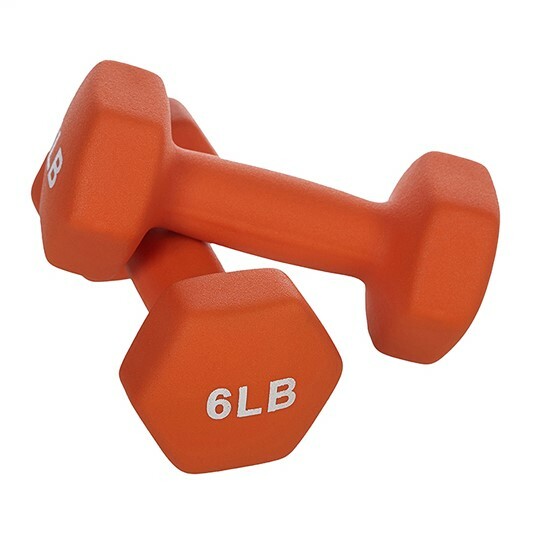 You will love the pro-youth results just in time for holiday festivities! Flaking may occur with this progressive treatment but staying moisturized with Rhonda Allison’s Drops of Essence Hydration will ensure your ability to go about your day as normal! Bring fall in this year with Rhonda Allison’s Pumpkin Apple Facial. An exciting facial created just for the season, this corrective treatment has everything you need to revive dry summer skin. Packed full of nutritious pumpkin and rejuvenating apple wine extract, this is sure to generate results. Tightens and firms, infuses skin with potent antioxidant support and brightens skin tone for a beautiful, glowing polish and radiant skin that will last for weeks. Is there really a difference in cheap drug store lipsticks and higher priced lipsticks? First let's take a look at what benefits women want in lipsticks; long lasting colors, non-bleeding, conditioning, creamy, pleasant or no taste or fragrance. So just what are the main ingredients necessary to give us this result? Waxes, oils, fats, emollients, paraffin and carnauba wax are the main ingredients to want to look for. Bonus ingredients would be Vitamin E and or aloe vera. The wax stabilizers help it mold to the container it will be supplied in and preservatives like alcohol and sometimes sunscreens, flavors and fragrance are there for obvious benefits and prolonged shelf life. The higher the grade of ingredients and the type of processing is important to the consistency, longevity or shelf life and increase the cost. Because it is made in larger batches, it is important for consistent color and smoothness that each dry ingredient be ground very fine and combined with the heated oils slowly stirred and once combined can be poured into cold aluminum molds and chilled until firm enough to put into containers for packaging. The higher priced lipsticks see a more detailed processing providing you the consumer with a better product! While all lipsticks may seem alike, any lip guru would know that just isn't true. Pay more and score yourself a long lasting lip wear that is filled with benefits that will last even longer. Have you heard the claims that woman consumer 4 - 6 pounds of lipstick a year? Lipstick weighs up to ½ an ounce. So to consume 4 pounds a year you would have to eat 118 tubes and that is a lot of lipstick! Moral to this story - wear your lipstick but don't lick your lips and consume it! Seriously though, since we do eat some of our lipstick, this is just another reason why higher quality ingredients are important! We are Serious about Hair Color! How serious is your salon about color? Heath hair salon and spa is very serious About YOUR hair color! When you walk into our state of the art salon, there will be no doubt on how serious we are about Your Hair Color! You will see one of the most grand hair color bars of all time!! You will see a professional environment unlike any you’ve probably experienced! You can be sure that your stylist is an expert colorist. 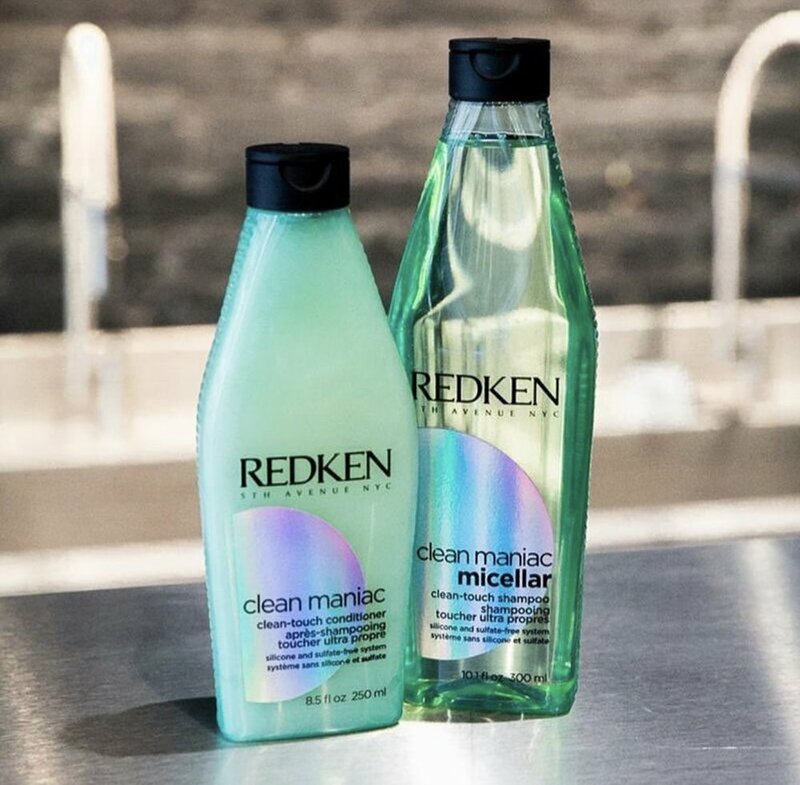 Redken Certified Colorist, Redken Specialist and Master Specialist provide you with the education, product and expertise you’ve been looking for. Ask your stylist about the last time they attended a hair show or hands on advanced class. Our team Takes our Education very seriously. 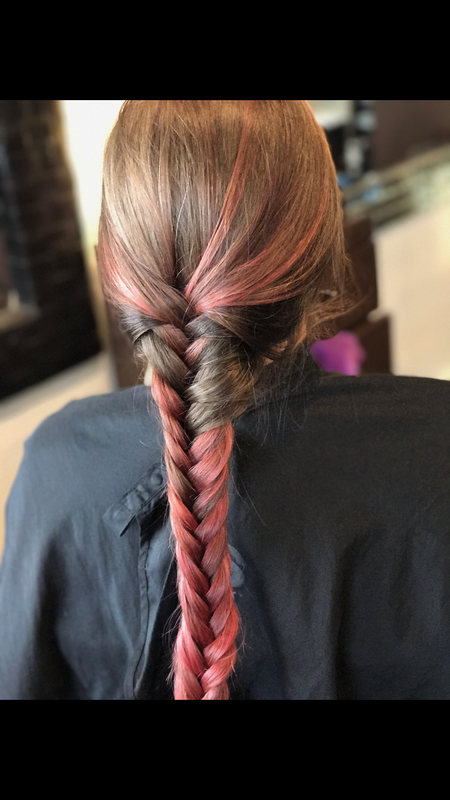 Several times a year, every year, we have Redken Artists Come to our salon with the latest and greatest in technique and product information. In order to be on our team, you must be skill certified in hair color and cutting techniques. What that means for you as a customer is that you are getting a higher level of expertise than most places provide. We also commit to giving you the very best and product to care for your Color and achieve the style you are looking for. At Heath Hair Salon You will be taken care of by Redken experts in hair color and cutting. You will not be limited by a few colors in a cabinet because we have committed to you with the state-of-the-art Redken color lab to have whatever is needed here and on hand to help you achieve whatever hair color and technique you desire. You will undoubtedly know that we are very serious about your hair color ❤️ Knowledge is power! Voluspa & Vendula! | Two brand new products! Our ever-growing lineup of gifts has recently expanded to include both Volspa, a complete collection of exotic fragrance candles and Vendula, a designer purse and accessory brand with unusual and funky handbags. When visiting our salon, we want to provide you with a unique set of gifts to browse while your stylist prepares their work area before your appointment begins. Stop in soon and see these new items for yourself! No matter how hard we try it seems almost impossible to stay away from using heat on our hair. Hot tools are amazing to create gorgeous hairstyles but just how bad is heat styling for your hair? In short, damaged hair and excessive heat styling definitely go hand-in-hand. If you aren’t protecting your hair from hot tool, then you can be drying it out or causing your hair color to fade. Putting down your hot tools for good isn’t always an option and it doesn’t have to be. If you want to keep using your curling irons, straighteners, and blow dryers, you just have to take a few extra precautions. Here are a few tips everyone who styles their hair should know about. This may seem like a no-brainer, but it is important to always use a heat protectant. Think of using heat protectant like using sunscreen before leaving your house. These products help to protect your hair, keep it healthy, and lock in your hair color. 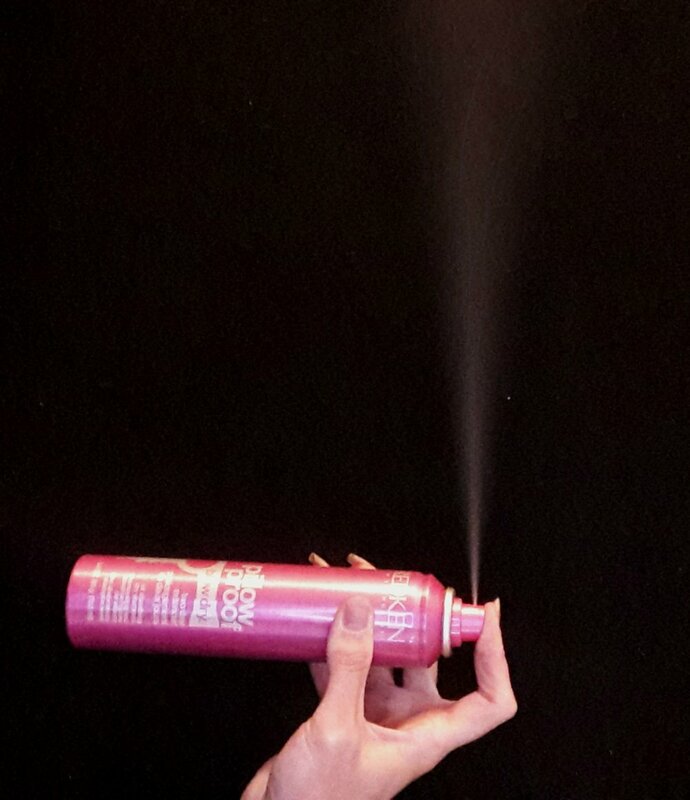 After applying the heat protectant, make sure you’re using the right temperature when styling your hair. Thinner, finer hair has a higher chance of getting damaged; it’s always better to use a lower temperature when styling your hair. Try staying under 200 degrees Fahrenheit when curling or straightening your hair. If you have thicker hair, you can keep your hot tools set between 200 and 300 degrees Fahrenheit. When using a hot tool to style your hair, don’t repeatedly run the tool through the same section of hair. You may think you are just trying to perfect that section of hair, but you could actually be causing damage. If your hot tool is set on the correct temperature setting, then one pass should be plenty enough. Try paying closer attention to how often you are using your hot tools. If you are using your hot tools too frequently, your hair may become brittle and damaged no matter how cautious you are. Try cutting back on the heat tools and give your hair a break. It is important to replenish your hair’s natural moisture after any heat styling. Try using a hydrating hair mask once a week and asking for a protein treatment every time you’re in a Redken elite salon. These two treatments combined will help strengthen your hair and keep your hair as healthy as possible. Your expert stylist will be able to recommend the best hair mask for your hair type. On days you aren’t using your heat tools, turn to heatless hairstyles to tame your mane. From boho braids to a messy up do, there are several gorgeous and easy-to-do hairstyles that don’t require the use of a hot tool. Be sure to keep some bobby pins and hairspray around for extra hold. Summer is here and ready to serve looks with these pastel trends. Want to make a statement this summer season? Fantasy colors may be perfect for you! Though pastel hair is nothing new in the beauty world, there are some fresh takes on it, and new techniques to achieve your look. From gorgeous shades of peach to pops of purple pastel, we can’t stop staring at candy-colored hair. If you are considering changing your look, here are our top five favorite pastel hair colors that are perfect for summer days. Ask your Redken stylist about City Beats, Redken’s semi permanent color line. 1. Whether you go icy ombre, or a baby blue balyage, pastel blue is an eye catcher. This is a gorgeous look that is sure to get attention. 2. For those that are wanting to dip their toes in the pastel color world, peach hair may be the perfect match for you. The peach color allows you to play around with brighter shades without going too extreme. It’s a beautiful soft, warm look. 3. Summer’s sweetest hair trend goes to bubblegum pink hair. This bubbly shade is perfect for anyone looking to make a statement. 4. Looking for a subtle change? Ask your stylist about this lilac hair color. 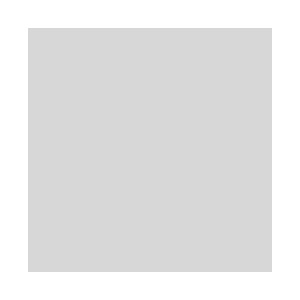 This beautiful subtle color blends easily with natural shades leaving a flawless finish. 5. Take the next step to the rose gold hair trend by going dusty rose. Ask your stylist to add a shadowed root at your hairline. This shadow creates a dimension and depth to your rose gold hair color that is amazing. Easy, Efficient and gentle cleanser for all hair types. Clean Maniac Hair Care featuring a Micellar Shampoo leaves hair with fresh-from-the-shower clean all day. The sulfate and silicone-free formulas deeply cleanse and lightly moisturize hair for a bouncy every day finish. Ready to dip your toes into one of 2017 most popular trends of Spring & Summer?? Here are a few things you need to know about ROSEGOLD! 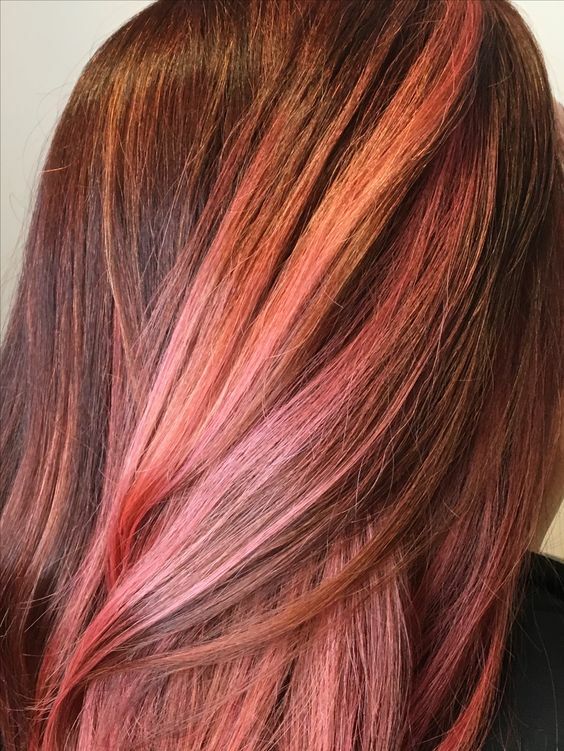 Rosegold is subtle yet fun take on strawberry blonde. This is created by blending golden blonde with red & pink. The Spectrum of Rosegold varies, there are so many option; from Pink, peach, orange, gold, dessert rose etc. Suitable for most skin tones. Like most "fun" colors, fading is inevitable, Keep Your Rosegold beautiful longer by using a color safe shampoo like Color Extend magnetic: sulfate-free shampoo and conditioner, that strengthens the hair fiber with soft flexible results from root to end. Avoid shampooing too often; try Pillow Proof 2 day extender to push through "dirty hair" days. If every day shampooing is a must, another great alternative is Genius wash which is a no foam cleansing conditioner that you can use up to every other day; paraben-free, no sulfate, salt or harsh chemicals. Conditioning treatments in salon & at home are highly recommended. A chemistry or ‘Chem shot’ treatment is a powerful punch of in Salon customized conditioning. This provides your hair with protein, softness, shine & even volume. We also offer an assortment of take home conditioning such as the duel chamber Color Extend Magnetic Mega mask. This mask provides a deep, intense conditioner & a care extender to provide ultimate vibrancy that lasts up to 3 washes. Set up your complimentary consultation with on of our Rosegold Experts today!! the Balm Cosmetics boasts a complete line of makeup with a "beauty in five minutes" philosophy. theBalm's multi-use, mega fabulous products have become its calling card, offering quick fixes and wondrous solutions for a wide range of beauty wants and needs. The company's wearable colors and fantastic formulas allow women to release their inner artist so they can look and feel fabulous. Get your calendars ready to save the date for an event you will not want to miss! On November 10 from 5-9 PM Heath Salon & Spa will be hosting their Annual Charity Holiday Blow Out event. This year our charities we have chosen are Patriot Paws and Rainbow Room, both local nonprofit organizations in the Rockwall area. There will be two Christmas trees displayed in the salon, one representing Patriot Paws, and the other for Rainbow Room. If you make a minimum donation of $25 to either charity of your choice, you will be given an ornament to write your name on. With your name on an ornament, you will be eligible to have your name drawn towards the end of the event. There will be four separate Gift Bundles, each up to a $1,500 value! If your name is drawn on November 10th, you will win one of our amazing Gift Bundles! You must be present to receive your prize. Win this bundle by donating to one of our featured charities! Win this bundle by donating to one of our featured charities! Win this bundle by donating to one of our featured charities! Win this bundle by donating to one of our featured charities! Under a tent, you will be able to enjoy a delicious dinner from Dallas’ food truck, Easy Sliders, and gourmet popsicles by Steel City Pops. Pick up a fresh flower arrangement from Petunia, Bunches Creative Botanical's VW Flower Truck and enjoy the local talent of our Rockwall Heath High School’s Jazz Band students. Inside, sip on a signature cocktail and give in to your sweet tooth with your pick of Holiday goodies. There’s nothing better than being able to eat and drink while getting some early Christmas shopping done! Jewelry designer, Tricia Ryan will be hosting a trunk show with all of her newest work including fresh water pearls, gemstones and crystals. We recommend the top brands Corkcicle, Redken, Michele Design Works, Quay Australia and Bomb Cosmetics for any gifting needs. Don't forget a gift card or a package of services at a discounted rate! We are so excited for our event this year and we can’t wait to see all of our fabulous guests and friends coming together to help give back to our community. Thank You To All Who Donated To The Blow Out! The annual Charity Blow Out planning has begun! On November 10th, we will open our doors to our guests, community and friends to celebrate the Holiday season. Our Annual Charity Blow Out gives back to two local, non-profit organizations right here in our community: Patriot PAWS and Rainbow Room. Heath Salon & Spa proudly supports Rainbow Room & Patriot Paws! Patriot Paws service dogs of Rockwall is dedicated to assisting Veterans and disabled in our community. They are currently training pups that will be the helper and companion of Veterans who served in Desert Storm. Rainbow Room of Rockwall is an emergency item resource center for children and adults who are being served by the Texas Department of Family and Protective Services due to abuse/neglect or suspected abuse/neglect. Their current needs are school supplies for the 2016-2017 school year. Donate to with Rainbow Room or Patriot Paws and you could win BIG! Partners in our community and surrounding areas have donated gifts for our Gift Bundle Give Away. *Minimum donation of $25 or more. The details: For every $25 donation you make, receive one ornament for our gift-giving trees. Pick to donate to Patriot Paws or Rainbow Room , whichever speaks to your heart the most. Each ornament represents one chance to win one of our Gift Bundles. You can choose which Gift Bundle you'd like to win...Gift Bundle details coming soon. Stop by to donate any time and join us in celebrating our community on November 10th from 5:00 - 9:00. Oh, gosh. Where to begin! *Come support the talented students in our growing community! They will perform two sets. 6:30 - 7:00 and 7:15 - 7:45 pm. *A portion of sales will be donated to our charities of choice. *Gift Bundles have a value of over $1,000 each! $25 or more donation required. Thanks so much to the National Charity League girls who have volunteered to help us host the event to ensure that our guests have the best experience possible! Congratulations to October’s stylist of the month Miss Valerie Piland! Valerie is one of our newest additions to our salon and we’re thrilled to have her here! Valerie has now been licensed for three years and recently moved to the Rockwall Heath area and joined our salon family. She loves all the people she has encountered while being at the salon and spa . She is excited about the growth opportunity she has at the salon. Out of all of her skills she enjoys coloring hair the most, from unique colors to blondes, she loves it. Along with colors, Valerie loves kids and being able to take care of them. She loves being able to make a little girl feel like a princess. Welcome to Heath Salon & Spa Valerie! Along with her hair skills, she loves doing special effect makeup. Want to make a statement at this year's Halloween party? Valerie can do your fantasy, gore, or zombie makeup. *Valerie will be offering a complimentary quick hairstyle to help complete your Halloween look. View More Makeup Ideas View more of Valerie's Work! Not into special effect makeup? Valerie has another offer for you! For the month of October only, with any color service Valerie is offering a complimentary haircut. CHECK OUT THE LASTEST FROM QUAY! THE CELEBS ARE WEARING THEM AND NOW WE ARE, TOO! Ever wonder where celebrities like the Kardashians find their super cute sunglasses? Look no more! Heath Salon & Spa is excited to announce we now carry Quay Australia sunglasses. Now you can look like your favorite celebrities at an affordable price. This company started out small in 2004, now blowing up worldwide, over 2,000 retailers now carry these sunglasses. Music inspired the look of these glasses to help express fearless personalities. We can’t wait to see our clients looking fabulous in these new glasses! What a better way to kick off the stylist of the month with announcing the promotion of Rachel Baby, now a level two stylist! Rachel, a licensed cosmetologist for two years now, has been a part of our Heath Salon & Spa family for two years. Rachel loves to make people feel great about themselves and has always had a passion for doing hair and makeup. She loves the environment that Heath Salon & Spa offers and enjoys working for a Redken Elite salon. Rachel’s services include all hair needs and waxing services. Rachel loves doing bright and vivid colors on clients and being able to go out of the box. Along with bright colors she enjoys being able to use new techniques to create the perfect balayage. Unfortunately, with all the chemicals we put on our hair to get that perfect look, it can sometimes lead to damaging our hair. One of Rachel’s top priorities with her clients is to restore and maintain healthy hair, allowing clients to have the look they want without having damaged hair. Rachel is also a member of our Bridal Team. Rachel can travel to venues or even do bridal hair and makeup at our salon in a separate area for your special day. Rachel loves being apart of the brides big day and making the bridal party feel good about themselves. Congratulations Rachel, we are all so proud of you! For the month of September only, Rachel will be offering a complimentary back bar service to her clients to show her gratitude to her clients. Who’s David? David Stanko has developed, evaluated, launched and taught professional hair color all around the world! His work and wisdom has been featured in dozens of publications including Vogue and Glamour. David has also been featured on major websites and beauty blogs. Our team learned the latest in color techniques including balayage and was inspired by David’s design ideas and tips. Our stylists are thrilled and can’t wait to share their learnings with their guests and use his ideas when training their associates. Wow!! What an honor! Thank you to the City of Heath for such a wonderful award. Thank you to our growing community, loyal friends and valued guests who allow us to do what we do best: serve our community. We cannot wait for these Mommy and Me Mini Sessions to get here!!!! On April 23rd, we are working with Carrie and her clients. We are providing them with incredible hair and makeup! Carrie has the perfect location picked out and we are so excited to make all the Mommies photo ready! And all of it just in time for MOTHERS DAY!!!!!!!! Schedule a Mommy and Me Mini Session, we still have a few appointments available!